Lee Bradbury admitted he has ambitions to further his manager career amid interest from Hartlepool United. The Hawks boss travelled to the north east during the week after being granted permission to speak with Pools over their vacant managerial position. He returned to steer the Westleigh Park side to victory over Braintree in the National League today, with Hartlepool director of football Craig Hignett yet to make a decision on the role. The News understands the former Football League side will make an appointment early next week. Bradbury said his interview with the club 'went very well'. And while he want to remain loyal to the Hawks, he said he's keen to climb the managerial ladder. 'I went up to Hartlepool and had an interview which I am led to believe went very well,' said Bradbury. 'Now I am waiting for them to get back to me. 'Until that changes I will continue to do what I have always done and give my best for the Hawks. 'All I will say is that I am ambitious, but at the same time I am loyal and have turned other jobs down in the past to stay here. 'The club were patient and stuck with me when we were relegated and I have in return remained loyal. 'It is up to the football club now to keep me here. 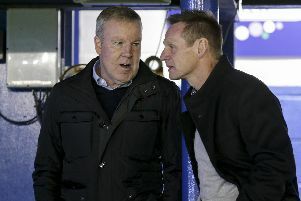 'If I am offered the job at Hartlepool, it is an attraction that it is full-time. 'Of course it is still non-league and a long way from home and my family. 'I will have a lot of decisions to make if I am offered the job. 'It is something, though, that I am seriously thinking about. 'I am still reasonably young at 43 and have managed now over 300 games.